Teste seus conhecimentos sobre os falsos cognatos com o simulado online de Inglês curso Enem Gratuito! São apenas 10 questões com resposta na hora e dicas para você estudar! Roraima is an interesting mountain located in the Guiana Highlands. The peak actually shares the border with Venezuela, Brazil, and Guyana, but the mountain is almost always approached from the Venezuela side. The Brazil and Guyana sides are much more difficult. The mountain’s highest point is Maverick Rock which is at and on the Venezuela side. Long before the first towns were built, before written language was invented, and even before plants were cultivated for food, the basic human desires to relieve pain and prolong life fueled the search for medicines. No one knows for sure what the earliest humans did to treat their ailments, but they probably sought cures in the plants, animals, and minerals around them. Times have changed, but more than half of the world’s population still relies entirely on plants for medicines, and plants supply the active ingredients of most traditional medical products. Plants have also served as the starting point for countless drugs on the market today. Researchers generally agree that natural products from plants and other organisms have been the most consistently successful source for ideas for new drugs, since nature is a master chemist. Drug discovery scientists often refer to these ideas as “leads,” and chemicals that have desirable properties in lab tests are called lead compounds. Relatively speaking, very few species of living things on Earth have actually been seen and named by scientists. Many of these unidentified organisms aren’t necessarily lurking in uninhabited places. A few years ago, for instance, scientists identified a brand-new species of millipede in a rotting leaf pile in New York City’s Central Park, an area visited by thousands of people every day. Scientists estimate that Earth is home to at least 250,000 different species of plants, and that up to 30 million species of insects crawl or fly somewhere around the globe. Equal numbers of species of fungi, algae, and bacteria probably also exist. Despite these vast numbers, chemists have tested only a few of these organisms to see whether they harbor some sort of medically useful substance. Pharmaceutical chemists seek ideas for new drugs not only in plants, but in any part of nature where they may find valuable clues. This includes searching for organisms from what has been called the last unexplored frontier: the seawater that blankets nearly three-quarters of Earth. No trecho “very few species of living things on Earth have actually been seen and named by scientists”, a palavra sublinhada é um falso cognato. A palavra “blankets”, sublinhada no último parágrafo, é, neste trecho, um substantivo no plural. Nos trechos “This includes searching for organisms” e “Pharmaceutical chemists seek ideas for new drugs”, as palavras sublinhadas podem ser consideradas sinônimas no texto. No trecho “Plants have also served as the starting point”, a palavra sublinhada tem a função de verbo, indicada pela terminação –ing. Mark in the answer sheet the sum of the CORRECT proposition(s) in which there is a false cognate (―false friend‖) and a real cognate (―transparent word‖), respectively. If we fail to understand and take care of the natural world, it can cause a breakdown of these systems and come back to haunt us in ways we know little about. A critical example is a developing model of infectious disease that shows that most epidemics — AIDS, Ebola, West Nile, SARS, Lyme disease and hundreds more that have occurred over the last several decades — don’t just happen. They are a result of things people do to nature. Disease is largely an environmental issue. Sixty percent of emerging infectious diseases that affect humans are zoonotic — they originate in animals. And more than two-thirds of those originate in wildlife. Adapted from: http://www.nytimes.com, July, 2012. The Millennium Development Goals (MDGs) are the most broadly supported comprehensive and specific development goals the world has ever agreed upon. These eight time-bound goals provide concrete, numerical benchmarks for tackling extreme poverty in its many dimensions. They include goals and targets on income poverty, hunger, maternal and child mortality, disease, inadequate shelter, gender inequality, environmental degradation and the Global Partnership for Development. Adopted by world leaders in the year 2000 and set to be achieved by 2015, the MDGs are both global and local, tailored by each country to suit specific development needs. They provide a framework for the entire international community to work together towards a common end — making sure that human development reaches everyone, everywhere. If these goals are achieved, world poverty will be cut by half, tens of millions of lives will be saved, and billions more people will have the opportunity to benefit from the global economy. Analise o que se afirma a respeito dos vocábulos retirados do texto. I. Comprehensive e supported são palavras falsas cognatas. II. Develop, improve, make e ensure são verbos regulares. III. Numerical, inadequate, environmental e global são adjetivos. IV. If (“If these goals are achieved…”) é um conector que indica condição. V. Towards é verbo, está no simple present e significa concordar. 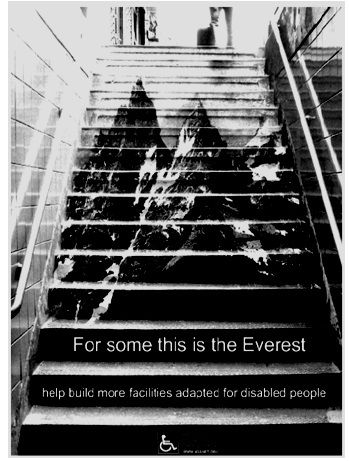 American Disability Association. Available on: <http://creativecriminals. 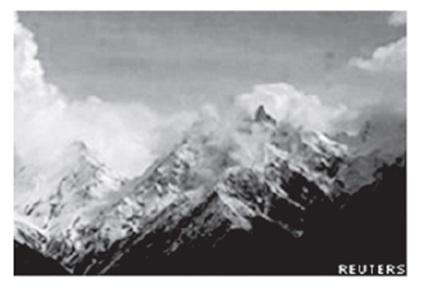 com/ambient/ada-mount-everest/>. Access on: Nov. 25, 2011.
the words “help” and “facilities” are false cognates. the word “disabled” refers to “facilities”. the word “adapted” is a cognate. the prefix “di-” in the word “disabled” expresses the idea of two. the word “build” is the subject of the sentence. 1 A team of scientists has shown that the glaciers in 2 one of Asia’s major mountain ranges are defying the 3 general tendency towards shrinkage, and have in fact 4 expanded slightly over the last few years. The range in 5 question is the Karakoram, which straddles Pakistan, 6 India and China on the north-western end of the 7 Himalayas. 8 Glacial decline and the gradual loss of polar ice 9 caps has been a worrying trend over recent decades, 10 but scientists have been aware of an apparently curious 11 anomaly with the Karakoram, which contains some of 12 the world’s biggest mountains including the second 13 highest, K2. It has about 20,000 square kilometers of 14 glaciers, accounting for three percent of the total area of 15 ice outside the Antarctic and Greenland ice sheets. 16 Now a team of French scientists has carried out a 17 detailed survey over a large area of the range using 18 sophisticated remote-sensing measurements. Writing in 19 the scientific journal, Nature, they say they found that in 20 the first years of this century the Karakoram’s glaciers 21 had actually expanded by a small amount, while in the 22 neighboring Himalayas they’d been shrinking. 23 It’s unclear why this is happening, but it seems that by 24 a quirk in the weather pattern that’s not fully understood, 25 less heat is being delivered to the Karakoram and the 26 mountains are receiving heavier falls of snow. (1) IF, by chance, you are served an unusually large slice of pizza, compared with what others appear to be getting, would that experience incline you, some minutes later, to eat more cookies or fewer when platefuls came your way? That depends, it turns out, on whether you are on a diet. Those who are not eat fewer cookies, whereas those who are see the excessive pizza as a licence to pig out. It is a demonstration of what Janet Polivy, a psychologist at the University of Toronto, refers to as the “what the hell” effect—a phenomenon familiar from real life to which Dr Polivy has given scientific respectability, most recently in a paper published in the latest edition of Appetite. (2) Dr Polivy and her colleagues recruited 106 female undergraduates on the pretext of rating a new brand of cookie. The women were told not to eat for three hours before the experiment, so that they would all be tested with the same level of hunger. An identical light lunch, it was explained, would be served to all. (3) And the lunches were, indeed, identical in size—a standard slice of pizza—but the women were encouraged to believe that they were not. Some of the volunteers got to see another person’s slice, just before it was carried into that person’s separate test room. The slice in question, actually carried by a member of the team, was either one-third larger or one-third smaller than the actual one that the experimental subject was given to eat. (4) After polishing off the pizza, the volunteers were presented with three generous platters of oatmeal-raisin, chocolate-chip and double-chocolate-chip cookies, and asked to rate them. They could eat as many, they were told, as they needed to reach their conclusion. What they did not know was that the plates were weighed before and after their foray into the test room, so the researchers knew to the crumb what the women had consumed. (5) At various points, the volunteers were given questionnaires. One focused on mood, and inquired about feelings like anxiety, sadness, depression and anger. Another asked about eating habits, including questions on how often the volunteer dieted, how much time she spent thinking about food and whether she ate sensibly in front of others only to splurge when alone. (6) People who had not seen anyone else’s pizza slice and those who had been given what appeared to be a small slice of pizza went on to eat the same amount of cookies. But the behaviour of those who thought they had been given a large slice diverged. Non-dieters ate fewer cookies and dieters ate more. (7) Dr Polivy’s guess is that non-dieters perceive that they may have overeaten, so they feel as though they should take it easy on the dessert. Dieters, on the contrary, feel that the large slice has blown their diet (and, even better, that this was not their fault), so they may as well make the most of it, and dig into the cookies. (8) Proving that is hard. Ask people about this sort of thing and they will lie—even to themselves. What the study does do, though, is add to the evidence that dieting is harmful. People who diet deliberately ignore cues like hunger and satiety. As a consequence, over time, they seem to lose the ability to use them. Instead, eating falls under their conscious control. And that is no place for an instinct. he finished to find out Word. he eventually found out Word. he ended to discover Word. All of words in each group are false cognates; EXCEPT one.